“Three Teens Trapped on Three Fingers Mountain” the news read back on Tuesday evening through Wednesday evening, August 26-27, 2008. Those were the “best-worst days” of our lives, since one of those teens was ours (and another we had custody for). My wife, Heidi, mother-in-law, Cheri, and I first discovered that the boys’ overnight adventure had turned terribly bad when we heard the report on the late night TV news. Assuming it was our boys who were trapped, we drove to the Green Mountain Forest Service Road (RD 41) off the Mountain Loop Highway, where the Sheriff’s Deputy confirmed our worst fears and allowed us access up the road all the way to the trailhead (today that road is blocked miles from the trailhead). The weather had changed significantly, and the boys were trapped in a storm at the 6,300 foot level not far from the 6,854 ft. summit, but unable to make it to the lookout tower, which was their overnight destination. Although it was late summer, it was raining, snowing and hailing where they were at, with wind gusts of up to 40 mph. Fortunately, they were high enough up the mountain to have cell phone contact with 911. Being a father, I naturally assumed I would begin my hike at midnight, in the rain, with a glacier and cliffs in the vicinity of the boys’ location, with an injured knee and improper equipment, in a desperate attempt to find my son. I also assumed it could very well be my last hike (ever), but what parent wouldn’t readily sacrifice their life for their child’s? That was the night we were first introduced to Search and Rescue. Prior to that night, we had no idea it existed here in Washington. I was told by Tim Dehnhoff, President of Snohomish County Volunteer Search & Rescue’s Operations Support Unit, who was on scene as OSU’s Team Leader, to “not to even think” about heading out on the trail, that I would only complicate a search that already was in progress and draw searchers and resources away from our son and his friends. In fact, there already was a “hasty team” more than an hour up the trail, fully equipped with headlamps, cold weather and overnight gear, ice axes and crampons for the glacier, who were in radio contact with the SAR Command Vehicle, and moving at a pace much faster than I would be able to muster even on my best day. So we remained at the Search & Rescue Base Camp near the trailhead, with Tim regularly providing what information he was allowed to share with us. The night was terrifying, not knowing if your child was going to live or die. It was too risky to get to the boys at night with the bad weather, cliffs, and rough terrain in the vicinity, so the hasty team got as close as they could safely go, and by 7am found the boys cold, wet, (moderately) hypothermic & exhausted, but very thankful to be alive. The hasty team immediately got the boys warm, dry, fed, hydrated and rested, and started to figure out how to extract them (our son had injured his back in a fall). All throughout that night and into the following day, more searchers arrived, not just from Snohomish County but also from neighboring counties as well. I discovered that the only person who was paid to be there on the side of that mountain was the Sheriff’s Deputy assigned to Search & Rescue and that everyone else, who dropped everything they were doing on a Tuesday night and following Wednesday, were all volunteers. One of the 3 boys walked out with searches Wednesday afternoon. Searchers accompanied the remaining two boys from where they were at on the side of a cliff to a spot further down the mountain where the helicopter (Snohawk 10) could safely land. They also had to wait for the weather to break long enough to safely allow for a pickup. At about 8pm Wednesday night, our son was the last to be helo’d off the mountain. During our 20 hours at base camp, we were amazed by the more than 70 Search and Rescue volunteers that showed up for our son and his friends. We were kept well informed from the Command Center, and well fed from the Food Truck. Not since my days in the Navy had I witnessed anything as amazing as I did on the side of that mountain. Snohomish County Volunteer Search and Rescue (SCVSAR) has over 300 volunteers on-call, 24-hours a day, to assist with emergencies and disasters in Snohomish County, including locating missing children, saving injured hikers, and performing rescues and recoveries during storms, floods and other natural disasters like the Oso mudslide catastrophe. SCVSAR is a non-profit 501 (c) 3, serving all of Snohomish County and its 750,000+ residents. They are often called upon to assist other counties as well. In a Ten-Year Summary by Year and Type of Mission conducted from 2003 thru 2012, SCVSAR provided a total of 68,654 volunteer hours on 1,250 missions; a per year average of 6,865 volunteer hours on 125 missions. The Oso landslide on March 22, 2014, was one mission lasting 38 days: 130 SCVSAR personnel made 697 responses for a total of 8,455 volunteer hours. My family is forever grateful to Search & Rescue. In the months following the Three Fingers rescue, Heidi, Cheri and I all joined Snohomish County Volunteer Search & Rescue and are members of the Operations Support Unit. SCVSAR’s Operations Support Unit (OSU) provides command, coordination, communications, documentation, logistics and search management assistance to the Snohomish County Sheriff’s Office (SCSO) and the Snohomish County Department of Emergency Management (DEM) when requested by these agencies. In the field, they provide direct support and coordination between the Incident Commander, a SCSO Deputy assigned to SAR, and SCVSAR field teams and units, making it possible for the teams and units to conduct their assignments. OSU is also responsible for the Command Vehicle and the Food Truck. Currently, Heidi and I are both OSU Team Leaders and Response Coordinators. Heidi is also OSU’s Vice President and the County Board’s Secretary. Heidi and Cheri are frequently called upon to do Documentation in the Command Vehicle, while I prefer Planning and Operations. Recently, I volunteered to be on the Family Support Team, knowing what it feels like to be in the shoes of a terrified family member on a mission, when it’s your loved one’s life at risk. Every member of SCVSAR is an unpaid volunteer. Our volunteers serve in one of five primary units, Operations Support Unit being one of them. The other units are Alderwood, Snohomish, Marysville and Everett Mountain Rescue. Some of our volunteers also are part of specialized teams that include: Helicopter Rescue, K9, Man Trackers, Mountain Bike, Project Care Track, Swift Water, Equestrian and 4X4. I am continually “blown away” at the abilities, commitment, and humbleness of the volunteers who regularly deploy into the field and who serve on these specialty teams. “That Others May Live” is much more than a nice quote; it’s a way of life to these quite professionals. It’s truly a pleasure to support these amazing volunteers however best we can. Not everyone can put in the time to become a Search & Rescue Volunteer, but many people who love the outdoors can financially support the people who will drop everything that they are doing to help others in need, or in the worst case, to bring closure to a family by recovering the body of their departed loved one. Someday, the mission could very well be for you or for someone that you love. There are lots of things that SCVSAR needs that the County or the Sheriff’s Department doesn’t pay for, and budgets are getting tighter all the time. One of the many items that SCVSAR is raising money for this year is for a new Food Truck, one of the most important and morale boosting vehicles to have at a mission. I was shocked on the Three Fingers mission, and on missions since then, at how much our volunteers spend out of their own pockets in order to have the equipment, the training and the skills they need to be mission ready. They already sacrifice so much of their time and talent; it would be a blessing if they didn’t have to sacrifice nearly as much as they do financially as well. 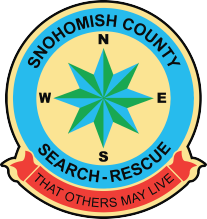 Please consider making a tax deductible donation to Snohomish Count Volunteer Search & Rescue (www.scvsar.org), a 501c3 organization, this year, and consider donating to SCVSAR every year. Know that your dollars are going to a great cause; know that your funds would be carefully and thoughtfully allocated to where they are most needed; and know that you’re making a tremendous difference to families such as ours. John McKeon – Grateful Father, and SCVSAR member since 2009.